Influencer marketing comes in many forms and generally operates on channels neither the influencer nor the marketer controls. As a result, finding industry standards in a world filled with non-standard variables can be nearly impossible. Carusele has been running award-wining influencer marketing campaigns since 2008 when we were just another division within our sister company, Ignite Social Media, a traditional social media agency. In 2015, we spun Carusele out as a stand-alone influencer marketing agency and set a mission to solve all the issues we saw brewing in the influencer marketing world. From inflated metrics to fake followers to the lack of context for measurement to the holy grail of whether your influencer campaign drove sales, we’ve tackled it all. 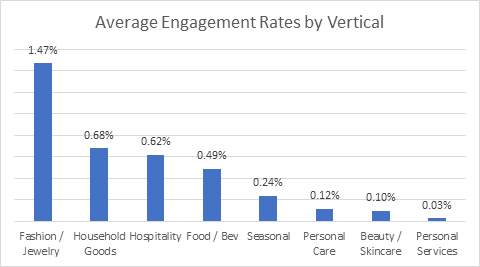 Below, we’re focusing on the key performance metrics that can indicate whether an influencer marketing campaign (lacking actual sales lift measurement) performed well in the context of its industry competitors. 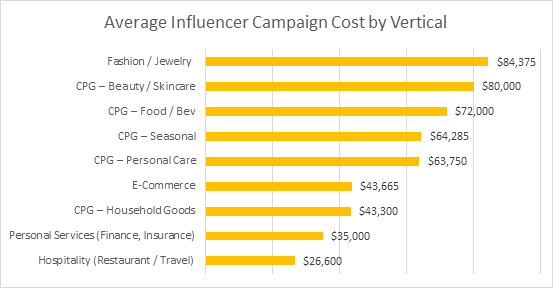 How Much Should an Influencer Campaign Cost? Depending on whether you manage influencers in-house or via an agency, whether the influencers you leverage are part of a talent agency, whether you leverage media to amplify their content, and whether you have tools in place to help your influencer marketing campaigns scale, can all affect the total investment for your influencer marketing programs. Generally speaking, regardless of whether you operate in-house or leverage an influencer marketing agency, the major difference in cost is going to be whether you’re paying internal salaries or specialized agency talent to conduct your campaign. That said, we’ve found it’s not uncommon for brands to discover engaging a specialized influencer marketing agency ends up delivering the same results for the cost in the long-run as operating an in-house team. Mainly because influencer marketing agencies can help you save in the other areas. Their skilled negotiators are better equipped to secure lower influencer rates, bypass talent agencies, and optimize toward lower media costs, not to mention the agency itself is splitting hefty tool licensing costs across its entire roster of clients and leveraging insights and learnings gleaned across tens (or hundreds in our case) of past programs. All that to say, these benchmarks should be roughly accurate regardless of whether your operating influencer programming in-house or leveraging a specialized agency for support. NOTE: Each of the below benchmarks is calculated using the “all-in” campaign cost. For in-house work, this includes the true total cost (labor, tools, etc.) not just what you pay influencers. 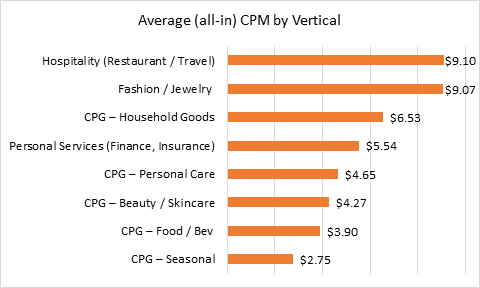 What’s the Average Cost-per-Thousand-Impressions (CPM) for Influencer Campaigns? Worth noting, impressions for influencer campaigns are not all created equal! Here’s a quick video on the many ways influencer marketing companies count impressions. The benchmarks below are based on the way Carusele influencer campaigns are designed and measured – a strategy that leverages influencers for their high-quality content production abilities, tests and scores every piece of content in the wild, then amplifies the best content using a variety of paid targeting mechanisms designed to drive your exact target audience to action. If you are counting purely max potential impressions from influencers, expect your CPMs to come in at ~1/3 of the numbers below (and don’t forget, the actual served impressions in that number are somewhere between 5-20% depending on the channels you’re activating). Influencer campaigns generally get more efficient as budgets increase and less efficient as budgets decrease. If you have specific requirements in terms of influencer reach (nano-influencers and social stars tend to be less efficient that “power middle” influencers) or if you have specific targeting requirements (just like a narrowly focused media buy) expect to pay higher rates. These are all-in CPMs – inclusive of all campaign costs listed above. We’ll offer guidance on how to calculate an influencer’s individual value in a future post. Your target audience (and resulting influencer selection), will have a significant impact on your CPM. For example, want millennial fashionistas on Instagram? Your CPM will be much higher than $9.07. Want ones who happen to also live in NYC? Go ahead and triple that number. *E-commerce campaigns are almost always optimized toward web traffic / conversion objectives and, therefore, CPMs are much higher than reach optimized campaigns. Carusele traffic and conversion optimized campaign have been excluded from the calculations above. What’s a Good Influencer Engagement Rate? At Carusele, we believe the most powerful (and real) engagement rate metric is calculated as (Total Engagements / Estimated True Views). However, since the industry standard (as best there is one) is to calculate impressions as “max potential reach” we’ve calculated the below benchmarks over what we call “blended impressions” – a mix of max potential reach and impressions reported by our media partners. Also, keep in mind, campaigns that include fewer influencers and more media should come in much higher. Campaigns that leverage no media, will come in lower. 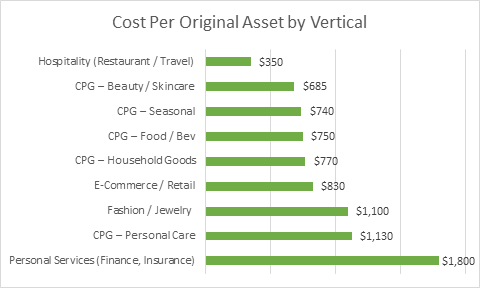 What Is a Good Cost Per Piece of Content Benchmark? Why does this even matter? Because good influencer content has long-term value. And time and again, we hear from brands that influencer generated content performs above average when leveraged for their owned channels. In fact, we found for a major e-commerce retailer, not only did influencer generated assets prove more engaging than brand created assets, but they were the highest converting ads run to-date from the brand’s owned social handles. So, when you’re used to paying $20,000 to your creative agency for a day-long photo shoot just to get a set of 10 photos, all with the same backdrop, realizing you not only got reach and engagement but also valuable creative assets from your influencer marketing budget should make for a very happy CMO. What’s a Good Saturation Rate to Look For When Choosing Influencers? While the marketing world seemed to be distracted by the fear of fake followers this summer, we’ve found a more important metric that can indicate the potential influence your influencers content will have on his or her audience. The Saturation Rate is a metric we look at closely when hand-selecting influencers for our clients’ programs, as we strongly believe influencers who have shifted away from the content that made them influential in the first place into a space where they are posting more sponsored content than their audience could rationally believe is authentic, are not actually influencing anyone! While the Saturation Rate can differ by channel and would be a beast to calculate across every channel of every influencer you’re vetting, we find a quick eyeball estimate of this metric on the influencers’ most prominent channel is enough to determine whether they have retained or lost the influence on their audience. Worth Noting: Acceptable Saturation Rates should be taken in context of the vertical and the POV of the influencer. For example, if the influencer is a true lifestyle influencer, followed because of the aspirational life she portrays, a higher Saturation Rate is a major issue as followers will recognize quite quickly this person can’t possibly love ALL the products she’s sharing. For mommy influencers in the food space who regularly create family recipes though, a higher saturation rate is less likely to turn the audience off as they’re following for recipes and meal inspiration and will buy the product if they like the recipe it’s in. Now that you have a better sense of benchmark metrics across the influencer marketing space, start comparing your results! And if you're just getting started and setting your foundation, check out our latest 9-step checklist to make sure the next steps you take guide you towards a successful campaign. Good luck!